My feet are up and I am absolutely stuffed but I have this hidden excitement that I cannot contain that always comes around so quickly every year! I have just volunteered at the Adelaide Christmas Pageant. I woke up before dawn and digged through my closet for my favourite Christmas shirt and Christmas accessories to get me in the Christmas spirit. It really is such a fun experience and seeing such an amazing team that comes together and unites for the pageant reminds me what Christmas is really about. It is a time to give, time to thank Jesus, and a time to cherish others in your life. For me Christmas is always a time of the year where I seem to craft and create more, and I have been busy doing this non-stop. As a result, my poor fingers are suffering a severe case of tendinitis but it is hard to pull the reins in when you are crafting away! I have quite a few ongoing projects that I have set myself a goal to finish before Christmas. There are so many possibilities to craft for Christmas that are great for gift giving so why not get inspired by attending a Christmas workshop by Flutterby Sewists, part of Functional Skills Focus. If you don’t know, Flutterby Sewists is the current group program that is nearly coming to an end for the year held at Old Noarlunga. The program involves teaching skills in a sequence that builds confidence to sew more independently, and is generously supported by the charity Aspire to Inspire Together. There are going to be some very proud sewists graduating the Flutterby Sewists Basic Sewing License and I have been so impressed by their dedication, persistence, patience, kindness and creativity throughout the program. An extension to this program is short workshops which are open to everyone from the community interested in creating something that is funky, creative and unique! Thanks to the lovely Flutterby Sewists, you can see a close up of the projects available. Click the link to see the flyer FSF Christmas Workshops 2017. 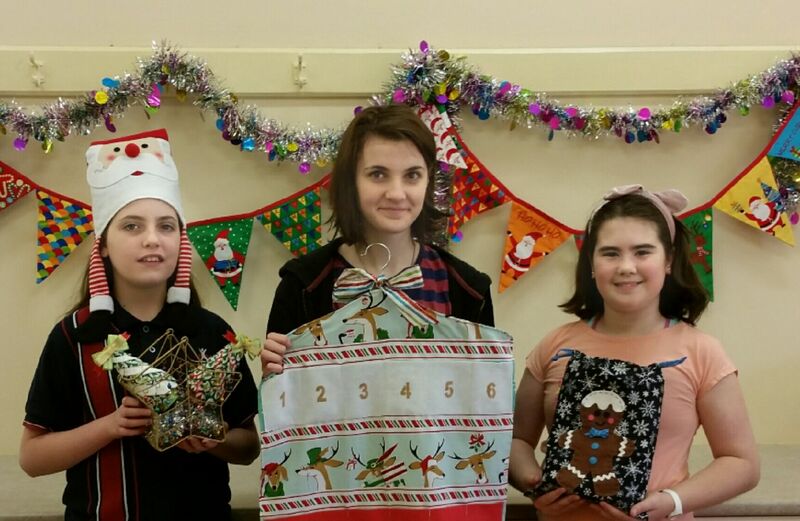 Workshops on offer include an Advent Calendar, Applique Bag and a Candy Cane Inspired Christmas Tree. There is certainly something for everyone from 8 years and up! This was really inspiring to read and definitely a time as we reflect on creation and also become creative ourselves. I love photo of these three beautiful young women and the lovely Christmas creations they are holding. Thank you for your kind words. Creating and crafting can be very therapeutic and relaxing. It is always exciting when you finish a project, particularly if you started it a long…..long…..time ago. That is also the fun bit, you always have your go to activity ready to pick up where you left off when you are wanting to chill out! My daughter is one of the girls in the photo above, I am sorry about your poor fingers but cannot thank you enough for providing the group program and the holiday workshops. Maddie has learnt so much in such a warm, inviting, encouraging and supported invironment, I really can’t recommend this program enough. Her self worth and self confidence have just blossomed. Thank you so much from one very grateful mother. Thank you very much Jo! I love what I do, so to hear such wonderful feedback of how Flutterby Sewists has made such a difference to her confidence and self-belief is really heartwarming.